Owen Dukelow is an intellectual property attorney who prepares and prosecutes patent and trademark applications in the mechanical and electrical arts, including computer science, Internet technologies, and renewable energy, and in particular wind energy. 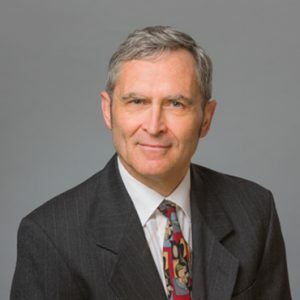 Owen handles intellectual property litigation in Federal District Courts, the Federal Circuit Court of Appeals, and the International Trade Commission (ITC). Owen locally supports clients from both our Portland office and our Bay Area office in Palo Alto, California. After graduation from the Ohio Institute of Technology, Owen worked as an engineer at Rockwell International, where he developed computer models of digital and analog circuits used to design advanced military aircraft. At Rockwell, he was responsible for systems engineering, ground tests, and trouble-shooting of an upgrade to the U.S. and Australian Air Force’s F-111 fighter/bomber. His work included integrating a Global Positioning Satellite (GPS) receiver and a ring-laser gyro navigation unit with updated displays and controls. Owen studied law while continuing to work full-time as an engineer. At the McGeorge School of Law, he was chosen to serve as a staff writer and articles editor for the Pacific Law Journal. He also won the American Jurisprudence award in his class in Constitutional Law. After joining Kolisch Hartwell, Owen undertook a diverse practice in both prosecution and litigation. He was on the brief in the precedential opinion from the Federal Circuit Court of Appeals, reported in Acco Brands, Inc. v. Micro Security Devices, Inc., 346 F.3d 1075 (2003).